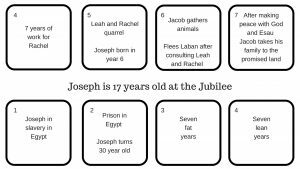 The New Year which starts in few days will mark seven years since I finally understood Joseph’s story. This chart helps explain the Genesis One creation story’s paradigm of seven in the second half of Genesis. The Seven Years Jacob worked for Rachel is a “FOUR”. In other words it is a fourth set of seven years of a 50 year Jubilee cycle. Publishing this chart now is a small attempt to set a new standard of understanding as Year-Four begins. For three years I have gently put my book and website out for public consumption. I was purposefully low key about the fact that this information can balance your emotions as you invest in the modern market place. I took this quite approach mostly because I value my credibility and the last thing I want is to be seen as just one more prognosticator. I have no interest in predicting the future but I am interested in learning how to think about the future based on the same information I believe Joseph creatively deployed in Egypt. In fact, I will go so far as to say I expect the blessings on Joseph and his sons found in Genesis 48:1-6, 49:22-26 and Deuteronomy 33:13-17 are being restored after a very long and painful ordeal. If you don’t know the story of Joseph and his descendants, learn it. Today we have all the resources of the internet at our disposal, there is a host of teachers and books available and ready to teach this amazing history lesson. Joseph’s legacy has had a great effect on our world but for many years the history of his descendants has been a story as lost as the burned books of the Alexandria Library. It is clear to me that Joseph used the seven-year pattern and the fifty-year pattern to rise to power in Egypt. As the chart above indicates his story starts with his father meeting his mother at the beginning of a fourth set of seven years. For the next 57 years we have a detailed biblical account in which one can track the seven-day creation pattern, in years and sets of seven years. Since it is my opinion that we are about to start a Year-Four in our current Seven-Year cycle, this coming year is the appropriate time to begin looking for and creating new standards using the knowledge we have obtained. We have seen Year-Three yield new life with generational seeds for future life. Don’t forget to show some extra generosity as Year-Three ends. See Deuteronomy 14:28-29 and 26:12-19. Now as Year-Four begins we can expect new standards to be set over the next revolution of the earth around the sun. Some will be caught unaware by these changes. However new approaches, industries or market structures will be necessary to carry us to new heights in later phases. Year-Four will show no new life but it will set the criteria by which we will function for what remains of this cycle and if managed well will provide resources as we move to the next Seven-Year cycle in a few years. This year, I hope you will commit yourself personally to looking for places to set some new principles in your life. Focus on the revealed timing, return to fundamental core principles for future growth and remember that the birds and fish, symbolic of nephesh and pride, will appear in abundance next year at this time. Thirteen months from now, Year- Five will be a dangerous time but productive for those prepared. Don’t waste Year-Four, with an eye on all the “appointed times” set a new standard, a new normal, which will aid your creative vision for the next decade.